Euro 2012 Spain vs. Italy: Spanish Side To Send Message To Italians: The last two World Cup winners are going to be on the same stage at Euro 2012 on Sunday afternoon, and it should be a heck of a clash. Italy and Spain are the two titans of Group C, and they are going to be in for a heck of a fight just to get out of this fantastic group. This is the toughest match for both teams, though. Our Spain vs. Italy match predictions should be interesting to say the least. Spain and Italy are teams that have a heck of a lot of history. There are a slew of World Cups and European championships between them, but one team is clearly heading in the right direction, while one is clearly going the wrong way. Italy hasn’t won much of anything in terms of matches, let alone major European or global competitions since the 2006 World Cup. Meanwhile, Spain won Euro 2008 and the 2010 World Cup, and it is charging to put together one of the most memorable run of results that any team has had in the history of this great sport. 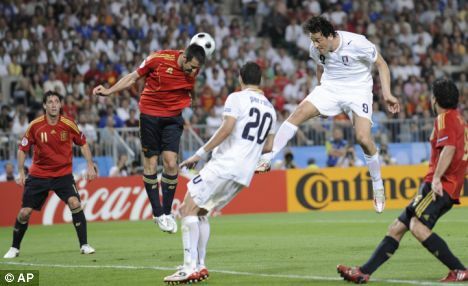 Click Here to bet on Spain vs. Italy Euro 2012! The Italians know that they have to be quite careful in this match. Tension is already running high for the club, knowing that there are a ton of probes going into the match fixing scandals across the country, and now, to make matters worse, Mario Balotelli, one of the best strikers that the team has to offer, has threatened to leave the competition the first time that he hears anyone shout out a racist remark. That has probably only further enraged the population in both Poland and Ukraine, many groups of which are known as racist fanatics. With that being the case, the defense is going to have to stay organized in front of Gigi Buffon, one of the best net minders in the world. However, Italy might be using a 3-5-2 scheme or something of the sorts just out of a lack of defensive players, and that could make for some real problems going forward for this match and for the rest of the tournament. Meanwhile, Spain is just a stacked team that is still young and hungry for sure. Fernando Torres must feel like he has a ton to prove for this team, knowing that the last time we saw him on the pitch in a major competition, he was being used off of the bench for Chelsea in the Champions League Final against Bayern Munich. Iker Casillas is still one of the dominating net minders that the world has to offer, and the midfield and defense are just chock full of players from Real Madrid and Barcelona, who are not just the two best teams in Spain, but perhaps two of the best club teams in the entire world as well. Of late, the Italians have been in terrible form. They were crushed at home by Russia 3-0 just a week before this tournament started, and that came on the heels of losing 1-0 at home against the United States in February. Even Uruguay came to Rome and beat the Italians 1-0 in a November tune up. About the only good thing that we can say about Italy’s form in its friendly matches is that it does have a 2-0 win in Poland, something that might prove to be worthwhile going forward as Euro 2012 heads across the country. Meanwhile, save for a bad spell in the middle of November when Spain was beaten by England at Wembley Stadium and drew Costa Rica in San Jose, the rest of the matches have been absolutely dominating efforts. Just since May 26th, La Roja has a 2-0 win over Serbia, a 4-1 win over the Korea Republic, and a 1-0 win over China. Spain vs. Italy Match Preview & Analysis: The Italians just don’t have the same brute force at both ends of the pitch that the Italians do. We really think that this is a match that is setting up for disaster for Italy, as Spain will just flex its muscles far too much to be ignored. This could be a multi-goal victory for the favorites.